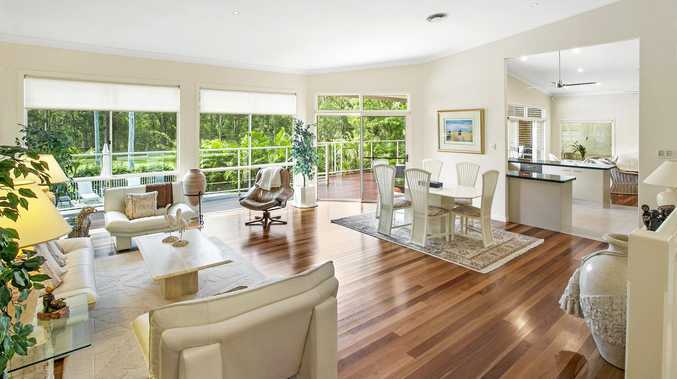 IDEALLY positioned in the Noosa Banks enclave, this magnificent residence offers luxury, tranquillity and easy living and is a must see for those looking to indulge in a spectacular home along with a relaxing and comfortable lifestyle. Designed to create a seamless integration between indoor and outdoor areas the entire rear of the home is made up of glass sliding doors and windows linking the vast north-facing timber deck to the living zones, kitchen and master bedroom. The most wonderful outlook can be seen from within the home across magnificent park-like gardens and down to Cooroibah Creek where you are welcome to launch a kayak or believe it or not, catch a mud crab or two for dinner. The in-ground pool sitting prominently at the back of the home surrounded by manicured gardens and is an outstanding viewing point from the timber deck above where relaxing will be an absolute pleasure. Highlighting rich polished timber floorboards, high ceilings, ducted air-conditioning and a full security system this home has quality and style at every turn. The master bedroom with ensuite and walk-in robe also enjoys access to the rear deck, all three additional bedrooms are spacious and serviced by a large main bathroom and the study is well positioned directly off the welcoming entry foyer. Presenting fantastic street appeal and a generous 1972sq m allotment where kangaroos play, there is an abundance of birdlife and even the occasional koala sighting. A game of cricket or football with the kids in your own backyard or fishing down by the creek, the whole family will love it here. Side access for your boat or van is an added bonus as is all the storage options available. Location is excellent - only minutes to Tewantin Shopping Village and the beautiful Noosa River and Gympie Terrace where you will find the vibrant café and restaurant scene. Noosa Heads with its surfing beaches and national parks, all an easy distance.